Beauregard was born at the "Contreras" sugar-cane plantation in St. Bernard Parish, Louisiana, about 20 miles (32 km) outside New Orleans, to a French Creole family. Beauregard was the third child of Hélène Judith de Reggio, of mixed French and Italian ancestry and descendant of Francesco M. de Reggio, member of an Italian noble family whose family had migrated first to France and then to Louisiana, and her husband, Jacques Toutant-Beauregard, of French and Welsh ancestry. He had three brothers and three sisters. His family was Roman Catholic. George Edward Perine (1837–1885), engraver. As Johnston's final troops arrived from the Shenandoah Valley, the Confederates launched a counterattack that routed the Union Army, sending it streaming in disorder back toward Washington. William C. Davis credits Johnston with the majority of the tactical decisions that led to the victory, judging that "Beauregard acted chiefly as a dime novel general, leading the charge of an individual regiment, riding along the line to cheer the troops, accepting the huzzas of the soldiers and complementing them in turn. The closest he came to a major tactical decision was his fleeting intention to withdraw from the Henry Hill line when he briefly mistook the advance of Johnston's reinforcements for the arrival of fresh Union troops." Nonetheless, Beauregard received the bulk of the acclaim from the press and general public. 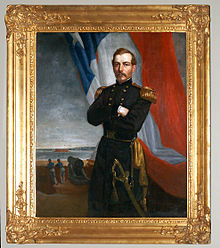 On July 23, Johnston recommended to President Davis that Beauregard be promoted to full general. Davis approved, and Beauregard's date of rank was established as the date of his victory, July 21. After Bull Run, Beauregard advocated the use of a standardized battle flag other than the "Stars and Bars" Confederate national flag to avoid visual confusion with the U.S. flag. He worked with Johnston and William Porcher Miles to create the Confederate Battle Flag. Confederate women visiting Beauregard's army contributed silk material from their dresses to create the first three flags, for Beauregard, Johnston, and Earl Van Dorn; thus, the first flags contained more feminine pink than martial red. 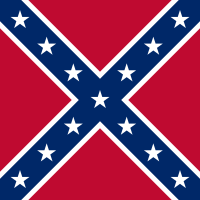 However, the official battle flag had a red background with white stars. Throughout his career, Beauregard worked to have the flag adopted, and he helped to make it the most popular symbol of the Confederacy. Having become a political liability in Virginia, Beauregard was transferred to Tennessee to become second-in-command to General Albert Sidney Johnston (no relation to Joseph E. Johnston) in his Army of Mississippi, effective March 14, 1862. The two generals planned the concentration of Confederate forces to oppose the advance of Maj. Gen. Ulysses S. Grant before he could combine his army with that of Maj. Gen. Don Carlos Buell in a thrust up the Tennessee River toward Corinth, Mississippi. The march from Corinth was plagued by bad weather, which delayed the army's arrival by several days, and during that time, several contacts were made with Union scouts. Because of this, Beauregard felt the element of surprise had been lost and recommended calling off the attack, but Johnston decided to proceed with the plan. In the Battle of Shiloh, which began April 6, 1862, the Confederates launched a surprise attack against Grant's Army of the Tennessee, which despite days of prior reports of Confederate troop movements, were completely unaware that the entire Army of Mississippi was coming right at them. Once again a more senior general named Johnston deferred to the junior Beauregard in planning the attack. 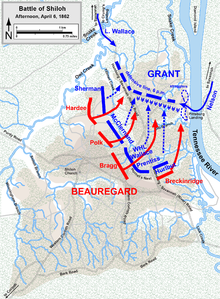 The massive frontal assault was marred by Beauregard's improper organization of forces—successive attacks by corps in lines 3 miles (4.8 km) long, rather than assigning each corps a discrete portion of the line for a side-by-side assault. This arrangement caused intermingling of units and confusion of command; it failed to concentrate mass at the appropriate place on the line to affect the overall objectives of the attack. In midafternoon, Johnston, who was near the front of the battle action, was mortally wounded. Beauregard, positioned in the rear of the army to send reinforcements forward, assumed command of the army and Johnston's overall Western department (officially designated "Department Number Two"). As darkness fell, he chose to call off the attack against Grant's final defensive line, which had contracted into a tight semicircle backed up to the Tennessee River at Pittsburg Landing. The major field operation of the fall was Hood's Franklin-Nashville Campaign, an invasion of Tennessee, which he undertook under Beauregard and Davis' orders. Beauregard always kept in touch with Hood, despite all the obstacles facing the latter General's way. The two would later develop a friendship lasting until Hood's death in 1879, after which Beauregard became chairman of the Hood Relief Committee; he arranged for the publication of Hood's memoirs, Advance and Retreat, in order to care for the orphaned Hood children. In 1869 he demonstrated a cable car and was issued U.S. Patent 97,343. Immediately after the Civil War, after being insulted and ridiculed in his own community, losing the right to vote, and becoming outraged in learning that properties he owned before the war just outside of the city limits of Memphis had been confiscated by the Freedman's bureau and developed into houses for blacks and a schoolhouse, he wrote letters to his friend John Slidell about his opinion on the emancipated black population. He wrote that the colored people were inferior, ignorant, and indolent. He gave a fantastical prediction "that in seventy-five years the colored race would disappear from America along with the Indians and the buffalo", and a more historically accurate one wherein blacks would be controlled by the whites politically; blacks had not yet voted in the South, and it did not appear to him that they would. Aux coups du dur destin, frappant sans nul égard! Lui donnant l'une et l'autre un prestige divin! Qui partant d'un ciel pur brille et ne meurt jamais! Une modeste palme à leur noble trépas! To the blows of hard destiny, striking without regard! That gave him a divine prestige. That leaving from a pure sky shines and never dies. A modest laurel to your noble passing! In 1872, the Reform party formed in Louisiana and was made up of conservative New Orleans businessmen, advocating an economical state government and recognition of black civil and political rights, and held the position that black political power was a reality and should be accepted. Beauregard was one of the leading members of the group. The Reform party attempted to coordinate its efforts on a state level with the Democratic party in order to elect a non-Republican governor. Beauregard, however, had different preferences for presidential candidates. He endorsed in a public letter the Liberal Republican nominee Horace Greeley, who at the time was running against Ulysses S. Grant. Beauregard "called for peace, reconciliation, a forgetting of old issues, and a union of conservative-minded people to remove corruption and extravagance from the government." In 1873, the Reform party created a detailed and specific plan to induce cooperation between the races in a political union. The plan called for the creation of the Louisiana Unification Movement. Approving letters and interviews about the movement came flooding into the newspapers. The majority of the communications came from businessmen who declared that they were willing to work with blacks and recognize their political and civil equality if they would agree to cooperate to lower the high Republican taxes. The chant of the Unification movement was "Equal Rights! One Flag! One Country! One People!" I am persuaded that the natural relation between the white and colored people is that of friendship, I am persuaded that their interests are identical; that their destinies in this state, where the two races are equally divided are linked together, and that there is no prosperity in Louisiana that must not be the result of their cooperation. I am equally convinced that the evils anticipated by some men from the practical enforcement of equal rights are mostly imaginary, and that the relation of the races in the exercise of these rights will speedily adjust themselves to the satisfaction of all. At Beauregard's death and funeral in 1893, Victor E. Rillieux, a Creole of color and poet who wrote poems for many famous contemporary civil rights activists, including Ida B. Wells, was moved by Beauregard's passing to create a poem, titled "Dernier Tribut" English: Last Tribute. Beauregard Parish in western Louisiana is named for him, as is Camp Beauregard, a former U.S. Army base and National Guard camp near Pineville in central Louisiana. The unincorporated community of Beauregard, Alabama, is also named for him. Four camps are named after Beauregard in the Sons of Confederate Veterans[further explanation needed]. Beauregard Hall is an Instructional Building at Nicholls State University. ^ User, Super. "Catholics and the Civil War". Archived from the original on August 18, 2017. Retrieved August 18, 2017. ^ Detzer, Allegiance, pp. 272–301; Williams, pp. 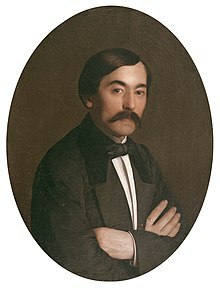 57–61; "Pierre Gustave Toutant Beauregard". Biography. Civil War Home. Archived from the original on May 14, 2011. Retrieved May 18, 2011. ^ Eicher, pp. 124, 323; Williams, p. 103. 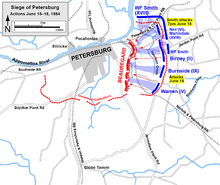 The official names of Beauregard's command were the Department of the Potomac (May 31 – June 2), the Alexandria Line (June 2–20), and the Confederate Army of the Potomac (June 20 – July 21). 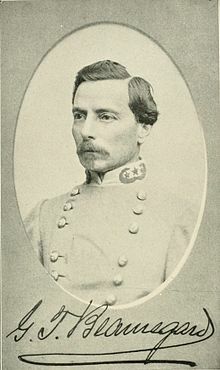 After the First Battle of Bull Run, Joseph E. Johnston merged his Army of the Shenandoah with Beauregard's and commanded the overall force, which was later renamed the Army of Northern Virginia. Beauregard persisted in calling his part of the army the Army of the Potomac, although he was in essence a corps commander in that army, reporting to Johnston until March 14, 1862. ^ Gevinson, Alan. "The Reason Behind the 'Stars and Bars Archived March 30, 2012, at the Wayback Machine.'" Teachinghistory.org Archived April 25, 2012, at the Wayback Machine, accessed October 8, 2011. ^ Guilbeau, James (2011). St. Charles Streetcar, The: Or, the New Orleans & Carrollton Railroad. Pelican Publishing Company. pp. 48–49. ISBN 9781879714021. ^ "Victor Ernest Rillieux: "Dernier Tribut"". French Centenary College. French Centenary College. Retrieved May 27, 2018. ^ a b c name="Monumental Heist: A Story of Race; A Race to the White House"> Charles E. Marsala (2018). "24". Monumental Heist: A Story of Race; A Race to the White House. eBookIt.com. ^ a b Williams, pp. 282–84. ^ "Confederate Gen. P.G.T. 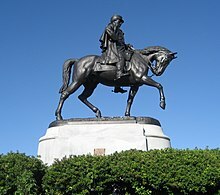 Beauregard statue is 3rd New Orleans monument to be taken down". USA TODAY. Retrieved February 26, 2018. Chisholm, Hugh, ed. (1911). "Beauregard, Pierre Gustave Toutant" . Encyclopædia Britannica. 3 (11th ed.). Cambridge University Press. Wikimedia Commons has media related to P.G.T. Beauregard.